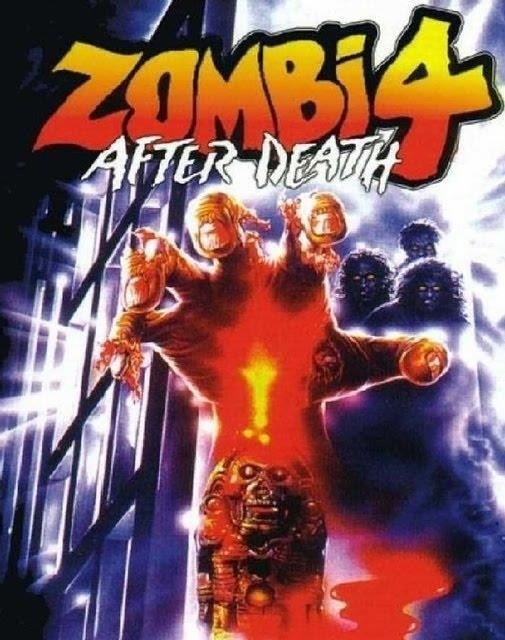 By this time the Italian horror film industry was on a major decline and Zombie 4: After Death was one of the very worst from the late 80s. Obviously we’re watching this movie to see a so bad it’s good movie and well you sort of get that, but for the most part you simply get a bad film, while there are some moments that are so bad they are fun they are few and far between, but for the most part After Death is just simply a terrible film from a terrible filmmaker. Zombie 4: After Death is billed as a sequel to Fulci’s Zombie AKA Zombie 2 and Zombie 3. But the Zombie 4 title was just thrown on for a marketing ploy. When you have Claudio Fragasso as the director you should know what to expect. He is what would be labeled a hack. Granted he never had much of a budget, but in the horror genre does that really matter? There are filmmakers out there who aren’t good storytellers, but can put together a well-made movie. Sometimes it’s the luxury of a budget that helps make your movie enjoyable. But in the horror genre, some of the very best were made on low budgets. You could give Fragasso 100-million dollars and his movies would still look poor and come out poor. The script by Rossella Drudi is lousy, but has she ever written a good screenplay? The script is just really poor and not in a good way where it’s fun. The characters are total idiots and often do the most idiotic things. Sometimes that is part of the fun, but not here. It’s kind of funny, Claudio Fragasso is best known for working with the late Bruno Mattei who in his own right was also a bad filmmaker, it was a match made in bad movie heaven. And Rossella Drudi is actually the wife of Claudio Fragasso. Kind of fitting they would marry each other isn’t it? Horror films often have idiotic characters, but sometimes it’s just annoying and in After Death it’s just that annoying. Director Claudio Fragasso (under the name Clyde Anderson) fails at pretty much every turn. It’s obvious he had no passion for this project and it very much shows. There are moments when Fragasso attempts some suspense and scares, but they don’t work very well. Bottom line is Fragasso isn’t a good filmmaker. He lacks any storytelling skills and his movies are also poorly made. But he does have his fans; he’s one of those guys that can craft a so bad its good movie. Though for me, his movies are just bad. The pacing is boring as there are many scenes where nothing really happens and After Death lacks any real excitement. The zombies look and move terrible; They range from fast moving to really slow, some talk and some don’t. Seems like Fragasso couldn’t make up his mind on what he wanted to do. Actually the zombies aren’t very zombie like. They at times come out more demonic, think Evil Dead and others seem more like humans infected with some kind of disease now think George A. Romero’s The Crazies. One of the main reasons to watch this kind of film is for the gore, but the gore is actually tame and when there is gore it’s not very well done. The make-up F/X was done by Franco Di Girolamo and I was rather un-impressed. He has done some solid work in the past, but he has also done some very poor work as well and here outside of maybe 2 or 3 gore scenes they look really poor. Franco Di Girolamo seems to be very hit or miss and here he was pretty much always missing. If the gore isn’t any good is there really any reason to watch this movie? I don’t think so. I understand the appeal of After Death and the appeal of Claudio Fragasso and while this movie and some of his others have their fun moments, but for the most part they’re just badly made and worst of all boring. It’s not really a surprise the Italian film market was dying around this time when you have movies like After Death. In closing while After Death has its fun moments, but for me they were very few and far between and I found myself mostly bored. As I stated this isn’t a sequel to Fulci’s Zombie 2 or Zombie 3. There is also Zombie 5: Killing Birds, but that also has no connection to Fulci’s movies or this one. Zombie 5: Killing Birds was actually released before Zombie 4: After Death so that shows you the lack of connection between the films.